Jenn Lane just announced on the #ForzaMonthly livestream that the next Bounty Hunter Rivals event should begin this Friday. 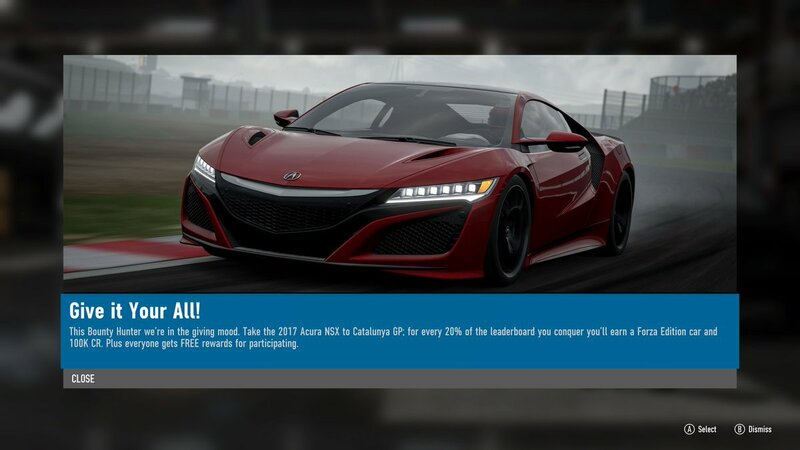 Instead of named bounties, the community will be racing against each other in tiers on the leaderboard, with a Forza Edition reward for each tier. Different generation Civic - they're talking about the 2016, not the 1997. These are all first-timers at the Specialty Dealer; the F40 Competizione is a Showcase reward in the Forza Driver's Cup Elite group. Wait...2 sets in 1 week? Was that the only time that happened? Because I thought its only 1 set every week. That would make my list incomplete again, arrgh. The extra group went up on Thursday, December 13 for free. Originally the clock was set to expire on the group but it's been extended to stay up through December 31. If you already bought the free Sagaris from the Specialty Dealer then this one won't add any extra Collector score points. This is the first extra-point opportunity for the other three. The 2016 Porsche was previously a Bounty Hunter reward in February and then a ForzaRC livestream Quest reward in June, when it came with a custom Forza logo livery. 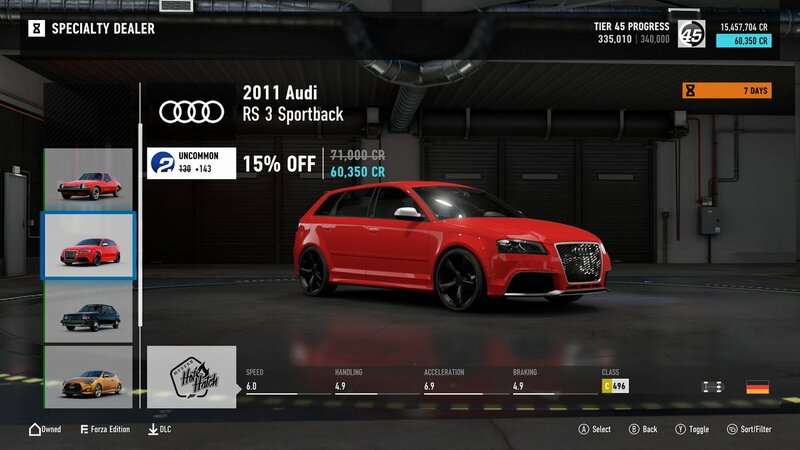 The specialty dealer is apparently bugged, it doesn't always display the garage symbol for when I already own the model being sold. I was caught out by this once before. It displays the symbol for SOME of the cars I own but not all. I have to assume this can't be by design. If it is, perhaps someone could explain the rationale as it is lost on me. For example, the 2016 Porsche 911 GT3 RS which I own. If I go to the car dealer, this model has the garage symbol to warn me I already own it. But in the specialty dealer? It doesn't. 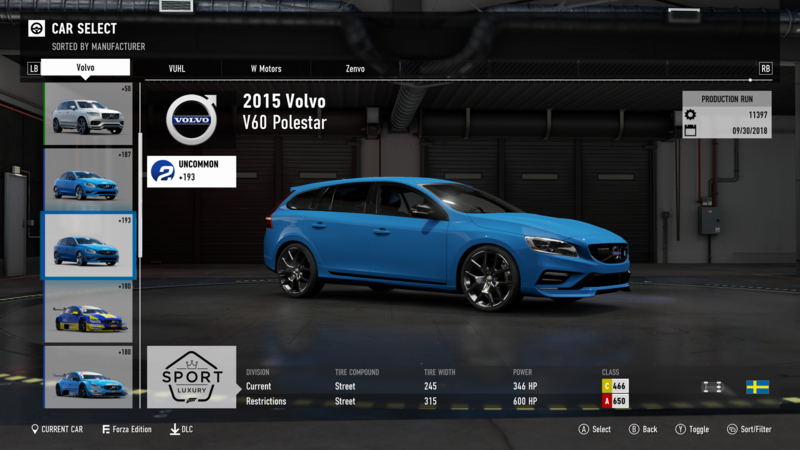 @FullNietzsche - select the SD car as if you want to buy it, then look at the points that will be added to your collector score. If the credit amount is less than the full amount eg +10 instead of say +135, then you already own the non SD version of the car; if it's zero, you already own the SD version. Okay if I click on the 911, which has 425 crossed out and a score of 468, it says my score will go up by 43 if I buy it. So that's the only way to know? Why not just put the garage symbol as well? I don't understand this decision. Seems to me they could make this a bit more user friendly and consistent. I have no doubt others are caught out by buying cars they've forgotten they already own, which with 700 cars and similar models is very easily done. It's been stated how, but it's still cryptic, confusing and inconsistent. The only sure fire way is to check in your garage. If you think the average end user can understand the system easily as it stands, I suggest you are mistaken. Anyway I'm not surprised. There's a lot of strange design choices in this game after all. These are all first-timers at the Specialty Dealer. It's 84 pages, I can't be expected to read all of it. this is my specialty garage cars list, and yours? Does anyone give a damn about whether the same car was bought from SD or elsewhere? There is no reason to treat them as different cars.